NEW figures have today confirmed that 297 people were officially recorded as having died from suicide in Northern Ireland in 2016. Records available from 1970 up to the end of June 2017 show that the total number of people known to have taken their own lives has now reached 8,158. 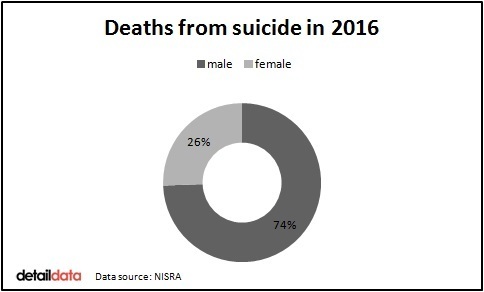 The Northern Ireland Statistics and Research Agency (NISRA) data confirms that 221 males and 76 females died by suicide during 2016. Provisional figures compiled by the Registrar General also show a further 164 deaths by suicide have already been recorded in the first six months of this year – 125 males and 39 females. This death toll from January to June 2017 includes two young people aged 14 or under. Suicide deaths can take time to be fully investigated and there is often a period of time between when the suicide occurs and when it is registered. The Department of Health has described the scale of loss from suicide as “unacceptably high” and said it is very concerned about the high number of deaths recorded in the first six months of 2017. In Northern Ireland and across the rest of the UK, reported suicides include cases where the cause of death is classified as either ‘intentional self-harm’ or ‘event of undetermined intent’. Of the people who died from suicide in 2016 – 74% were male (221) and 40% were aged between 15 and 34. The final 2016 data contradicts figures contained in four quarterly reports for 2016 which are still available on the NISRA website. These show 305 suicides registered during 2016 - eight higher than the final published figure. 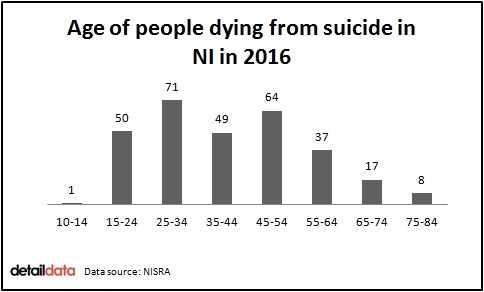 Last year, Detail Data reported that the highest ever annual number of suicide deaths in Northern Ireland was recorded during 2015. And in 2014 we revealed that almost as many people had died from suicide in Northern Ireland since the signing of the Good Friday Agreement as were killed during the entire Troubles. There is no simple explanation for why someone chooses to die by suicide and it is rarely due to one particular factor. Experts say mental health problems are important influences, as well as alcohol and substance misuse, feeling desperate, helpless or without hope. The Department of Health has consulted on Protect Life 2, a draft suicide prevention strategy for Northern Ireland. The new strategy was due to be published in 2017 but the department has confirmed it requires both "Ministerial signature and Executive sign off". Siobhan O'Neill, Professor of Mental Health Sciences at Ulster University, said: “I am shocked that the suicide death numbers are not really going down. They vary slightly year on year, but there is no downward trend. The trend in the rest of the UK is downwards and in Ireland it is stabilising. “We need a suicide prevention strategy as a matter of urgency but we don’t have a government to sign off on it. “However, even if we did, the draft strategy was too narrow and focused on people already in contact with mental health services. I am also concerned about plans to restructure the Lifeline service. Professor O’Neill said 8,158 suicide deaths since 1970 is “horrific and appalling” and will have affected a huge number of people. “Each suicide is estimated to cost the economy at least £1million so if we look at the costs and what we are spending on suicide prevention, it doesn’t add up,” she continued. "Every single death from suicide is a preventable tragedy. “I fear that the number of deaths may even increase in the future due to the impact of welfare reform. People working on the ground are talking about dealing with levels of poverty we have never seen before. Pat McGreevy, from the Suicide Down to Zero charity based in Downpatrick, said: “We have no public information campaign designed to prevent suicide. We need to start talking about suicide to address the stigma and to encourage people to come forward to seek help. “We need a radical approach to prevent deaths. There is no acceptable level of suicides. Just chipping away at the issue isn’t enough. “Suicide has left a lifelong emotional scar on families across Northern Ireland. There can be a huge number of people directly affected by even a single suicide. “Inter-family suicide is also an issue we are extremely concerned about. This is where other members of a family also take their own lives after losing someone to suicide. We asked the Department of Health to comment on the new figures. A department spokesperson said: “It is important to consider suicide trends over a relatively long period. “Increases or decreases by quarter or year should not be considered in isolation. The department monitors the change in the suicide rate on a rolling three year average. “The suicide rate in Northern Ireland has remained relatively steady over the past decade, although we acknowledge that the scale of loss is unacceptably high. "We are also very concerned about the high number of deaths recorded in the first six months of 2017. The department spokesperson said that reducing the suicide rate in Northern Ireland continues to be a priority and that £7million is allocated annually to suicide prevention by the department through the Public Health Agency. It said this funding level would continue under the new suicide prevention strategy. However, the strategy requires "Ministerial signature and Executive sign off". “It was clearly recognised in the consultation that Protect Life 2 must encompass a wider field than health and social care services and that suicide prevention is the responsibility of all Executive departments,” the spokesperson added. The Registrar General's annual report for 2016, can be accessed here. The quarterly tables so far for 2017 are available here. Lifeline is the Northern Ireland crisis response helpline service for people who are experiencing distress or despair. It can be contacted confidentially on 0808 808 8000.